Curioso Cuff YouTube Video Reaches 35,000 Views! As an added bonus, if you share our video on your social media channels, we’ll give you 10% off including free shipping. Email us at info@curiosocuff.com and send us a screenshot of your share and we’ll pass along our coupon code! Women have worn jewelry practically since the dawn of time. All kinds of baubles and trinkets were found throughout history on all kinds of women. It didn’t matter class or status it was just a part of life to adorn oneself with pretty things. It’s truly one of the best parts about being a lady! One of those items worn could be a wrist cuff. This piece of jewelry was popularized during Egyptian times, and one can picture Cleopatra Queen of The Nile having different wrist cuffs up and down her arms. So if you are thinking of adding to your jewelry collection a wrist cuff might be the way to go. You probably have plenty of earrings and necklaces, so why not have an interesting wrist piece to wear? These are three wrist cuff jewelry pieces that you must have to add to your collection. 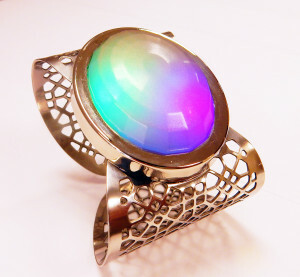 This wrist cuff is unique because it’s not only beautiful to wear, but it also magically lights up! Well, it’s not magic really, it’s just the battery that operates it that creates the gorgeous light that works on three different settings. You can customize your Curioso experience. It’s lead and nickel free so you don’t have to worry about it irritating your skin. As an adjustable cuff, anyone can wear it. You’ll love the attention you receive when you have it on, since it’s the ultimate conversation starter anywhere you go. People will stop and ask you where you got that interesting piece of jewelry. This is especially fun on a night on the town with your gal pals when you want to catch the eye of that handsome man down by the corner of the club. Saddle up next to him, give him your best smile, and you’re sure to get the conversation rolling about what you are wearing on your wrist. A Curioso Cuff is definitely a must have, so stop by their website today to find out how you can order your own conversation starter. Sometimes you want your accessories to be the star of the show. This is especially true if you are wearing a little black dress, headed out to a night on the town with friends, in hopes of meeting that special someone new. That’s just one of the best ways to wear the Curioso Cuff. A piece of jewelry that is more than pretty, it’s the ultimate conversation starter as well. You can’t find anything like this that will attract more attention, and spark new people to want to talk to you just to ask where you got your interesting accessory. Not only is the cuff beautiful, unique, and super stylish, but it can be worn on either of your wrists. It adjusts to fit the wearer perfectly. Made of strong material that is lead and nickel free it won’t irritate your arm at all, even if you are sensitive to different kinds of metals. The woven lace pattern of the cuff is high style at its finest, with the soft glow of the center stone created using three different interactive settings. So you can customize it for a night at a fine dining establishment, or amp it up for a brighter “club ready” version. You’ll be the center of attention with this fine piece of brilliant bling. In addition to my social media channels, I’ve decided to start this blog in the hopes that it will serve as a communications vehicle between me and you (my valued customers), and other readers interested in learning more about style and fashion. On a monthly basis, I plan to update you on what’s happening with the Curioso Cuff as well as inform you about exciting developments within the fashion industry, and share my commentary on the latest news and trends in the fashion world. My goal is to offer you insightful information, valuable advice and helpful tips. This is our way of staying connected with those who want to be informed about the industry in which we work. I hope to bring much value to the fashion and style conversation, and I encourage you to comment on my monthly posts. You are the ones who will ultimately determine the success of this blog. Your ideas and feedback are very important as we build this blog together! Additionally, if you have a great story or any advice you think our readers would enjoy, please email me at info@curiosocuff.com and I’ll add it to the blog. Join our mailing list for all Curioso Cuff news. Stay updated on all Curioso Cuff news. 2017 © Curioso Cuff ®, LLC, All Rights Reserved.